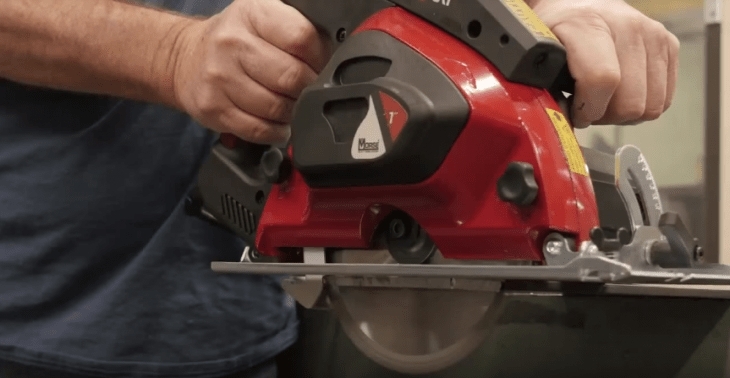 Best 7 1 4 Circular Saw Blade Reviews: Top-5 in April 2019! One of the most useful but most dangerous tools in a good toolbox is the circular saw. This versatile instrument is capable of adapting to cut all materials including wood, metal, and ceramics. In the hands of a proficient user, a circular saw can be used for more than just cutting but can be used for shaping and creating bevels. Before I present the five best 7 ¼” circular saw blades on the market, I want to add a few words of precaution about the safety issues when using them. Always make sure the blade guard is secured and protects you while cutting. It is preferable to use a shoe or footplate for steadying the saw when used on a flat surface. Use a depth adjustor to maintain the depth of the cut; it really does work. When using the saw to create bevels, find an accessory that lets the foot plate tilt in relation to the blade. Circular saw sizes are classified by the blade diameter. The most common sizes of 5-1/2 to 7-1/4 inches. Circular saws come in a variety of materials and blade shapes, each one designed for a specific task, and this is important to understand. Using a blade for one material will not produce good cuts in another, and can even be dangerous when used on other materials. Cracking and breaking of blades while operational, to overheating and material fire dangers, are the most common causes leading to life-threatening occasions. I added a buying guide section at the end of the review, but now, let’s look at the five best 7 ¼” saw blades on the market. 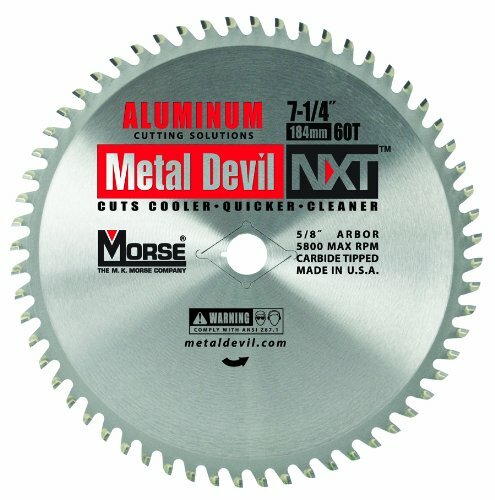 This is the MK Morse 7-1/4″ x 60T Carbide Tipped, Metal Devil NXT Circular Saw Blade, for cutting aluminum and other soft metals. The Metal Devil NXT is a combination of 60 teeth with carbide tips and made of high tensile steel designed for optimum performance at 5,800 rpm. This blade cuts cleanly and effortlessly through aluminum and other softer metals. When cutting through soft metals such as aluminum, copper, brass and such, a focused saw is always your best bet. This blade is designed just for these metals and will deliver perfect cuts every time you use it. It’s a preferred blade for handling aluminum extrusion construction. The Freud D0760X is a 7-1/4-Inch by 60t carbide tipped blade is perfect for wet lumber and melamine applications. 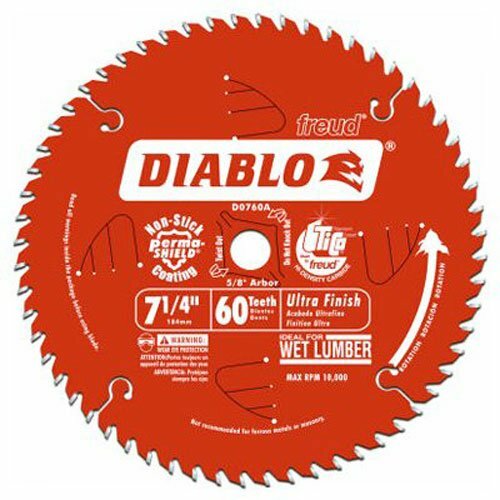 Diablo’s Ultra Finish Blade is a combination of thin kerf to handle cleaner cuts, and anti-vibration fabrication technology to reduce “wobbly” cuts. This is the product of fine cabinetmakers professional design and the blade is best suited to cut through oak, pine, melamine, veneer plywood, wet lumber, and delicate molding. The cut is clean, and there is no chipping when applied correctly. The Perma-Shield Non-Stick Coating is added to assure that the wood surface does not stick to the saw blade during use. Any carpenter seeking a clean cut must consider the saw blade carefully. This is a true work of mastery, and you will never have any issues when using this blade to cut your wood parts. Hard, soft or wet woods are all effortlessly and cleanly cut with this blade. The Milwaukee 48-40-4123 is a 7-1/4 in. diameter, 24 carbide tip steel blade used for cutting wood. This blade comes with a thin kerf and 24 teeth with carbide tips, designed for cutting through hard and dense wood. The steel alloy blade is constructed with heat vents and expansion slots to provide extra cooling features during the cut. 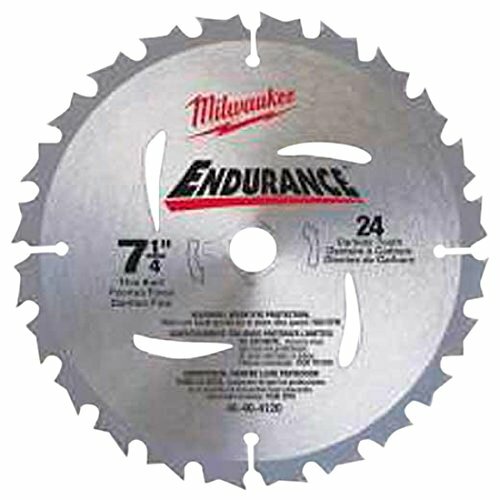 When framing and cutting through either hard or soft wood for construction, this blade delivers fast and furious as well as clean and accurate cuts. If its speed at work, and meeting deadlines, then this is the no-nonsense blade for you. The SKL 75312 is a combo pack that holds two separate blades for a complete cutting cycle. There is an 18 tooth carbide tipped blade, and a 40 tooth carbide tipped blade. 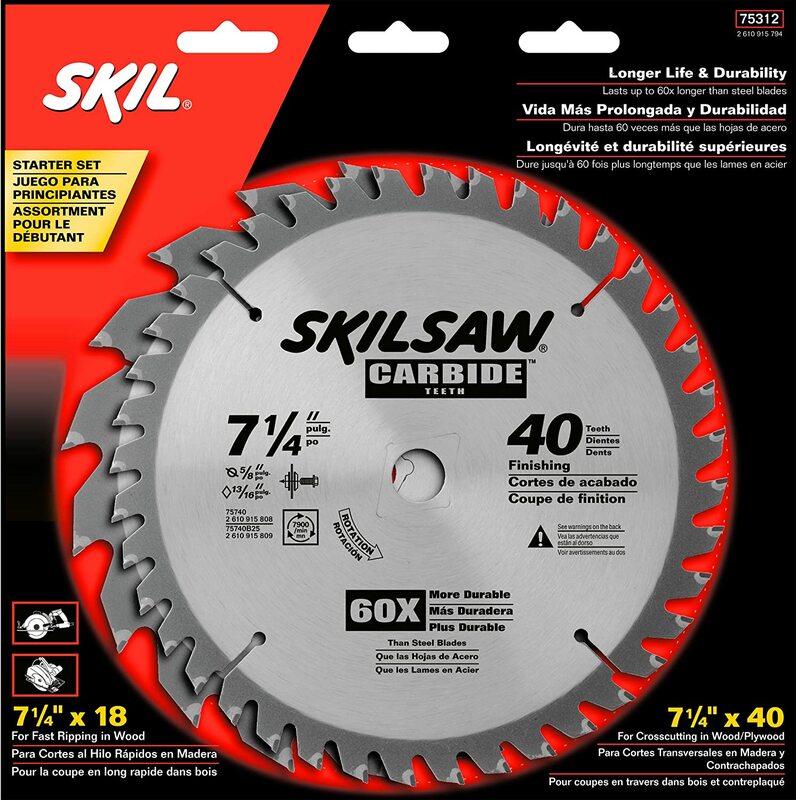 Skil 75312 is a two-pack of circular saw blades. These blades are made of steel with tungsten carbide tips designed specifically for wood applications. The 18 tooth blade is for fast rough cutting, and the 40 tooth blade is for fine finishing cuts and for plywood application. Both blades come with expansion slots designed to assure the blades run straight and true with sharp cutting edges for enhancing speed. These qualities are combined with the clear anti-stick coating that resists heat, friction, and binding while being uses. If you want a complete woodcutting set and don’t want to start looking at hundreds of different options, Skil provides you with an effortless decision-making solution. This is a great DIY set and will provide you with top performance for both rough and fine wood cutting requirements. 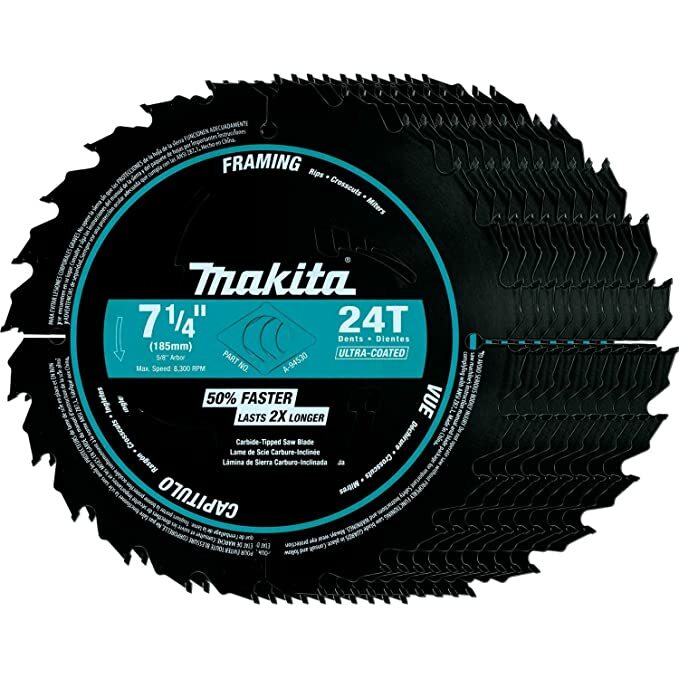 The Makita 7-1/4 in. 24T Ultra-Coated Framing Blade is a classic wood cutting blade that comes in a pack of 10 for the professional workman and carpenter. This 10 pack is important in quantity as it is in quality. The 10 pack makes it efficient for a full-time professional that doesn’t want to keep running to stock up, and with one pack gets a perfect saw for cutting through all wood effortlessly. These blades are coated with a non-stick surface treatment; their design is “M” shaped which gives you two cutting points. This means that the 24-tooth performance is equal to a 48-tooth finish. The tips are made of High-grade C-3, fine-grain Tungsten carbide. As an active contractor, I always keep a good stock of blades around the shop. Having access to a new replacement blade is imperative for high-performance work efficiency. Having top class blades is an added bonus. So this 10 pack is a great advantage when traveling around, or as a stock holding package for my workshop. High-speed steel blades are harder than standard steel blades and stay sharper longer. Carbide-tipped blades have carbide tips attached to their teeth. Diamond-tipped tile-cutting blades are specially designed for cutting ceramic tile. Abrasive inserts are used in masonry blades for cutting concrete, brick, cinder block and other masonry materials. Standard circular saw blades these are the usual wood cutting blades that many refer to, and come with any number of teeth from 18 up to 60 dependents on the finish you seek. Just remember that the fewer the teeth, the faster the cut, but the rougher the cut. The more teeth, the longer it takes to cut, but you get a very fine and accurate finish. The gullets between the teeth are for removal of material, and some have heat expansion slits for extra durability. Rip-cut blades are designed with fewer teeth, usually between 16 to 40 and are used for cutting fast into the wet and grained wood. The design of these blades includes a deep gullet, and there is one tooth for ripping and four for crosscutting. Framing blades have 24 teeth, these are for rough joinery work and usually found in all construction sites. Plywood blades require a lot of teeth, and in most cases, they have 100 or more fine teeth. These are designed to cut through the multiple layers of the plywood without creating splintering and board separation. Thin-kerf blades are narrower in design and used for fast cutting with minimal waste. Hollow-ground blades are designed to reduce the friction between the body of the blade and the material, as such the teeth are wider than the blade. You will find this in most if not all carbide tipped blades. Continuous-rim blades sometimes called diamond blades are used to cut through masonry and metals. Turbo-rim blades are diamond blades with a serrated rim, they are very similar to continuous rim blades, but the serrated rim lets you cut through brick, tiles, and concrete. Segmented blades (dry cut blade) are also diamond edge blades; these have rim divided by gullets similar to those on a standard blade. This is the roughest masonry blade and is usually used to cut concrete, brick, concrete pavers, masonry/block, hard/reinforced concrete, and limestone. Abrasive blades come in a plethora of configurations and are used to cut many different materials, from masonry and ceramics to metals. They should not be used on wood since they create a lot of friction and lead to immediate scorching and fire. Within this group come many subcategories, so remember to check what material you are cutting before buying the first abrasive blade you see.